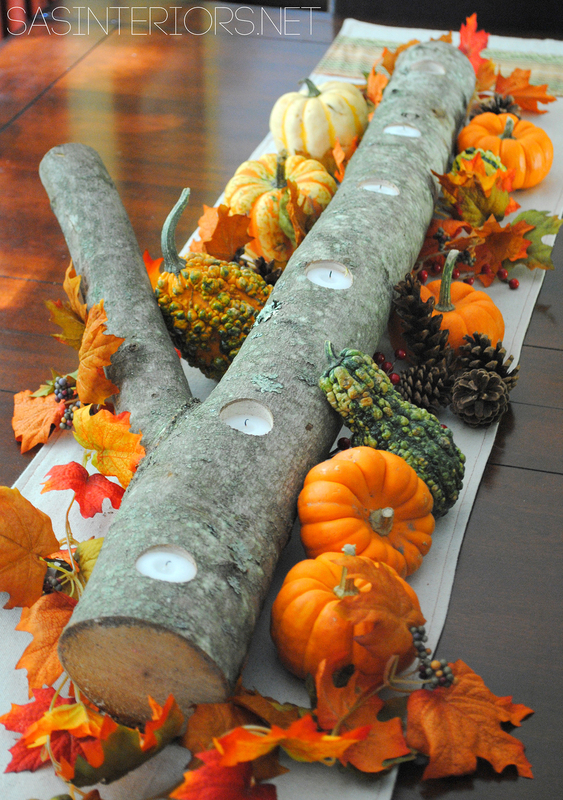 When it comes to DIY fall centerpiece ideas, look no further than your own backyard. Autumn tablescapes are all about showcasing the natural beauty of changing leaves and bountiful harvests. Gather up bright leaves, fallen acorns, and pinecones for quick and simple rustic displays. Use rough-spun fabrics, like burlap table runners, to complement the texture of natural materials or shiny fabric, like satin, to provide contrast. For understated elegance, stick with monochromatic color palettes, like shades of ivory and gold, and accent the arrangement with metallic elements and glass. Simple white candles elevate any display and add a touch atmospheric lighting. Pumpkins and gourds are a must, of course, but for long-lasting arrangements, look for foam versions of these autumn staples. Not only can these be used year after year, but they can also be painted, carved, or cut open and used as vases or containers. And speaking of vases, now’s the time to break out all kinds of unconventional containers for your nature-walk finds; galvanized buckets, apothecary jars, flowerpots, and even hollowed out logs make beautiful backdrops for your arrangements. 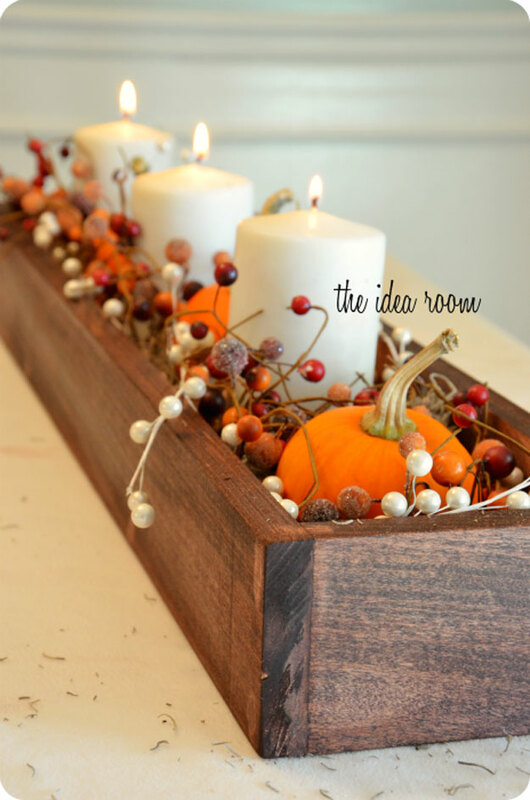 Whether you’re creating dramatic dinner party tablescapes or just a simple end table display, check out this gallery of 27 beautiful DIY fall centerpieces that are sure impress. 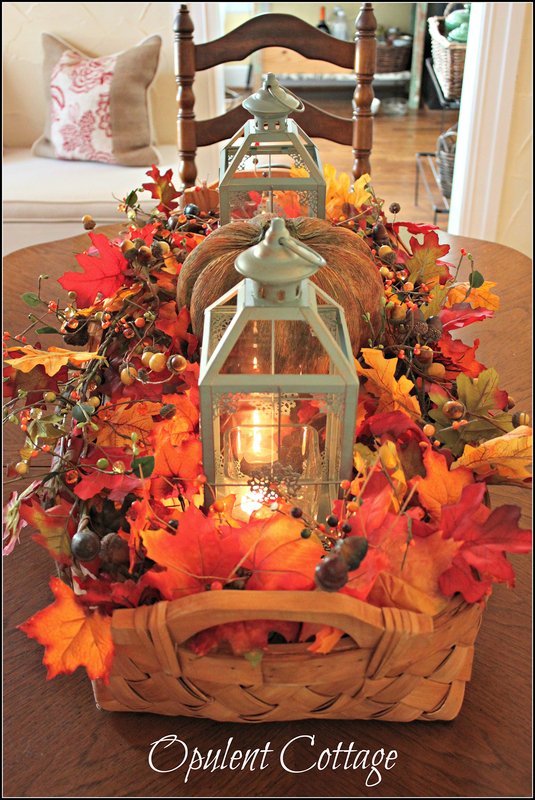 The highlight of this arrangement is a paper mache pumpkin flanked by two lanterns. Fall leaves fill in the nooks and crannies of this large woven harvest basket. The soft blue of the lanterns stands out amongst the warm hues of the leaves. This arrangement will look good on your autumn table but would work on your sideboard as well. Pillar candles and berries fill this rich wooden box for a delightful centerpiece perfect for the fall. The box is long and narrow, making it a great fit for any dining table or a fireplace mantle. White candles and pumpkins nestle into a base of Spanish moss, surrounded by winding vines of white and red berries. 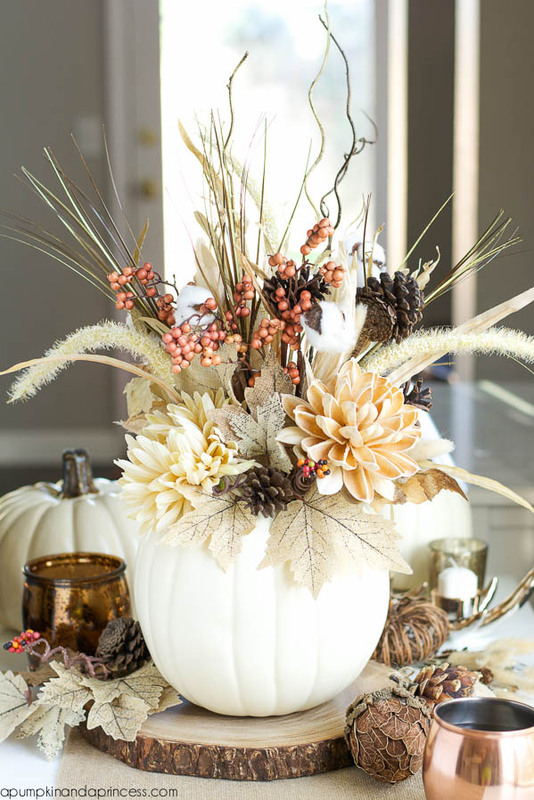 A faux white pumpkin brings a fresh feel to this centerpiece. A few tall branches bring height to the arrangement, while off-white flowers spring from pine cones, cotton stems, and orange berries. Silvery white leaves finish filling out the pumpkin, making it perfect for both autumn and winter entertainment. Pair a large wooden bowl and a glass hurricane to start this harvest centerpiece. The wooden bowl can be a family heirloom or something you pick up at a yard sale. A white candle fills the hurricane glass with a warm glow. A bounty of pine cones, acorns, and faux fruit fill the curve of the bowl surrounding the center light. 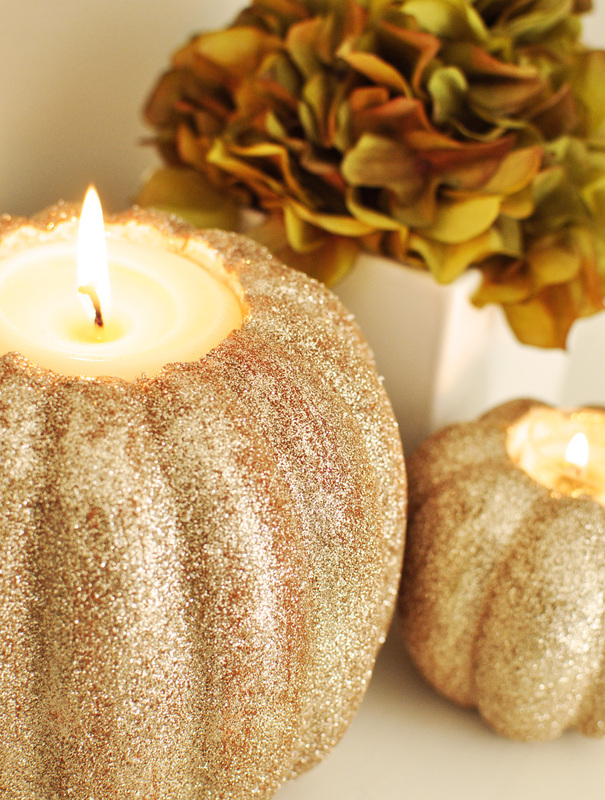 Styrofoam pumpkins embraced in glitter hold candles for an unexpected light display, perfect for your autumn table. A drill and a craft knife work together to create the hole for the candle. The entire piece is covered with glue then generously sprinkled with glitter. You can mix up glitter and pumpkin colors for a customized display. Red apples are one of the treats of the autumn season. 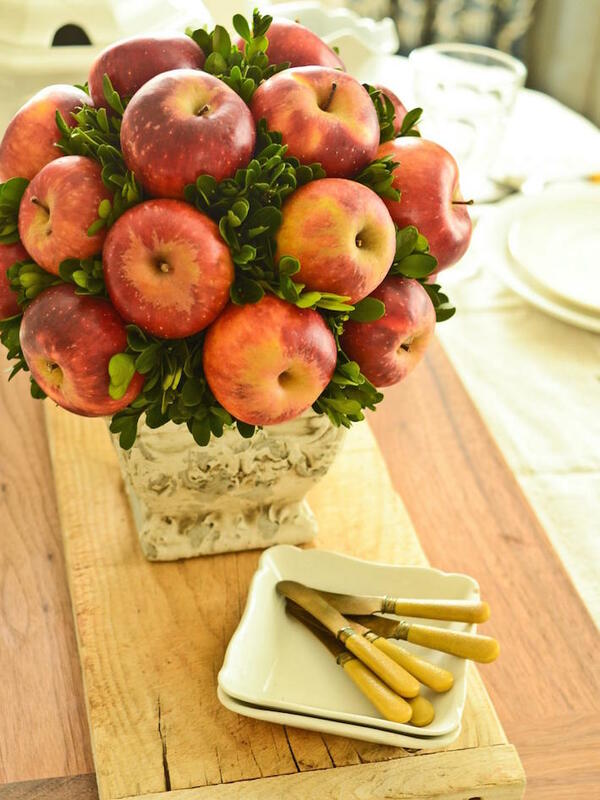 An apple topiary is one way to bring this seasonal fruit into your home decor. Florist skewers secure each piece of fruit that creates the colorful display. A flower pot creates the perfect backdrop for this round luscious topiary display. For a twist, pears can be substituted for the apples. A simple tree branch displays tea lights in a natural frame perfect for the fall. This branch is four feet long with a side branch that sticks out about a foot to one side for added stability. A drill bit dug a small hole for each of the tea lights. 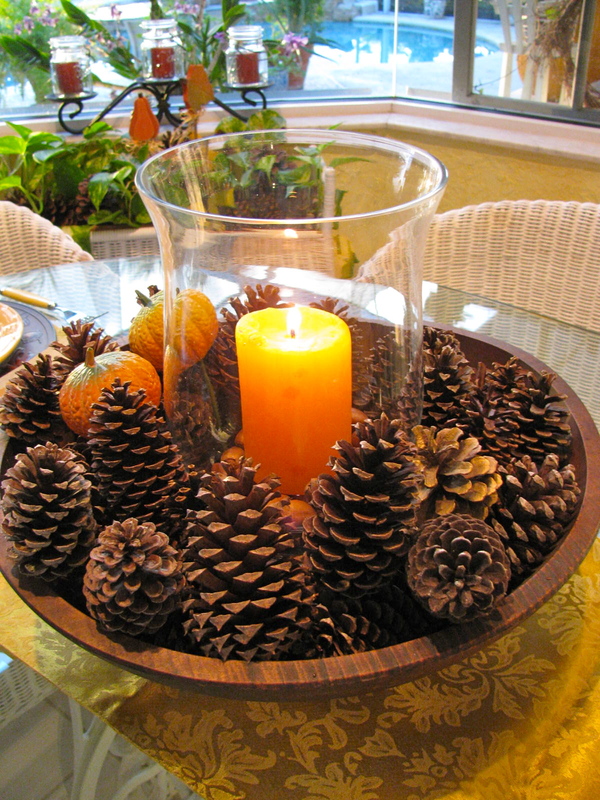 Pumpkins, pine cones, and autumn leaves frame this natural centerpiece. 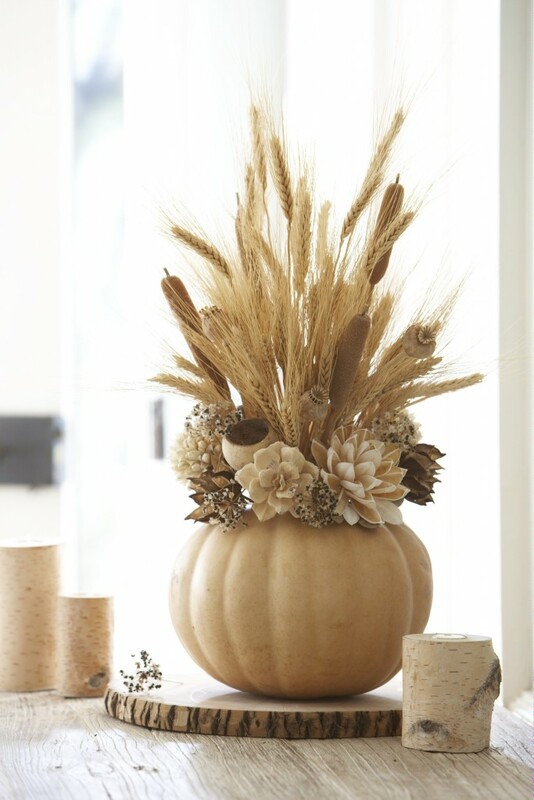 Dried foliage springs forth from a base of off-white flowers and a faux pumpkin. Wheat, dried cattails, and dried poppy blossoms add height to the center of the display. Silk flowers ring this center display, peaking out of the off-white pumpkin base. This round centerpiece works well on smaller dining tables or sideboards. 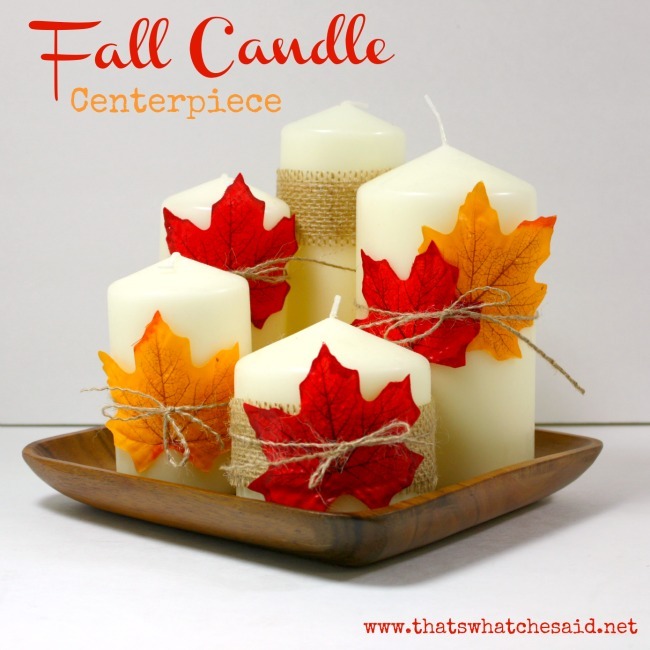 Rugged simplicity is the name of the game with this candle centerpiece. Five candles in varying heights and widths fill a wooden tray. Each candle has a band of burlap around its center. Each candle gets one or two autumn leaves added to the band, tied off with a strand of burlap string. 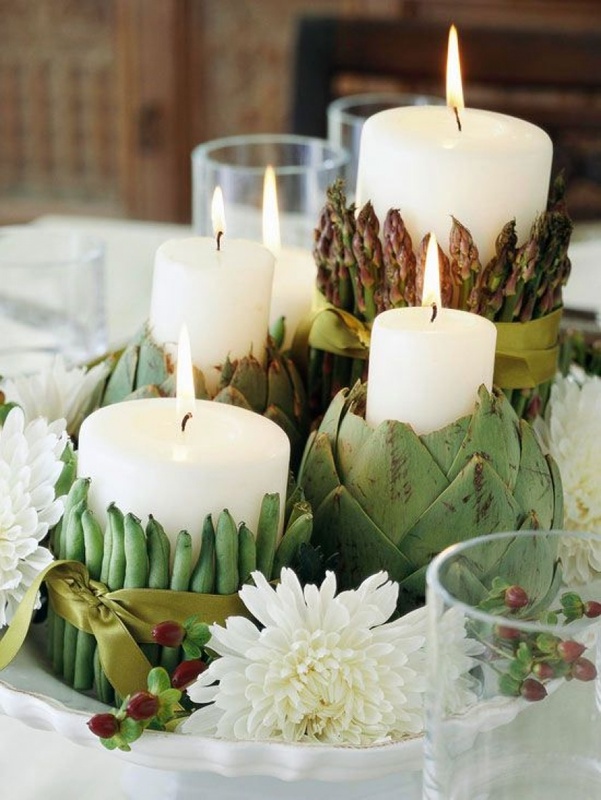 Fresh green vegetables encase simple white candles for a striking natural centerpiece. Strong rubber bands secure green beans and asparagus. A pretty ribbon hides the rubber bands with a decorative touch. Cored-out artichokes make perfect bases for smaller candles. The candles sit on a simple white base, nestled among white mums and berry springs. Apricot roses and deep red mums combine for a truly colorful autumnal display. A real pumpkin forms the base of this rich floral display, with a clear short vase nestled inside. The flowers flow up and away from the base, nestled into broom cob. 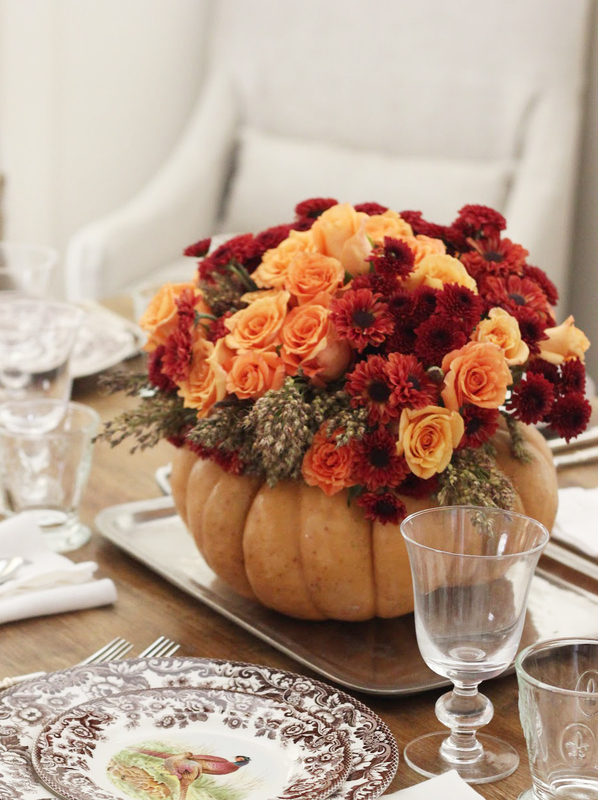 The entire arrangement sits on a simple silver tray, letting the pumpkin and flowers stand out. 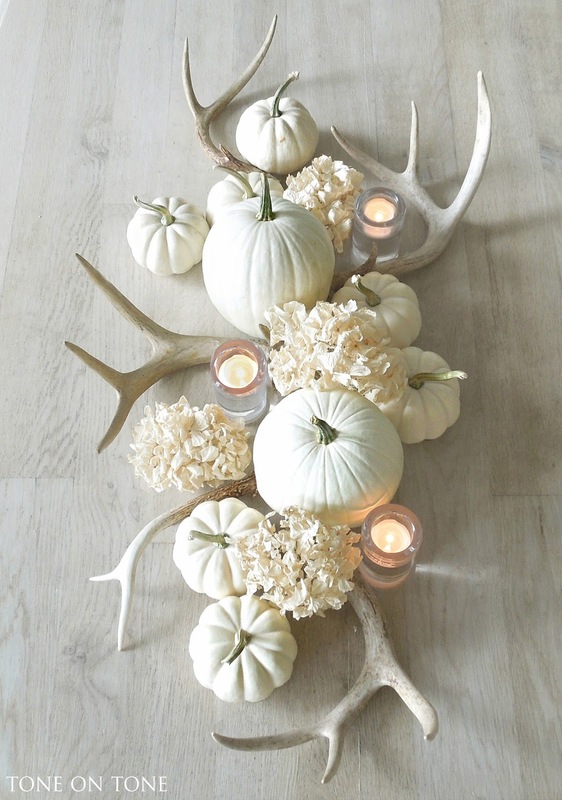 Driftwood white antlers set comfortably next to white pumpkins in this long centerpiece. These naturally shed antlers get their color from sitting out in the sun. Creamy white pumpkins sit amongst the antler curves, with votive candles and white hydrangeas filling in the blanks. With a bit of rearranging, this display would work well on a round or square table. 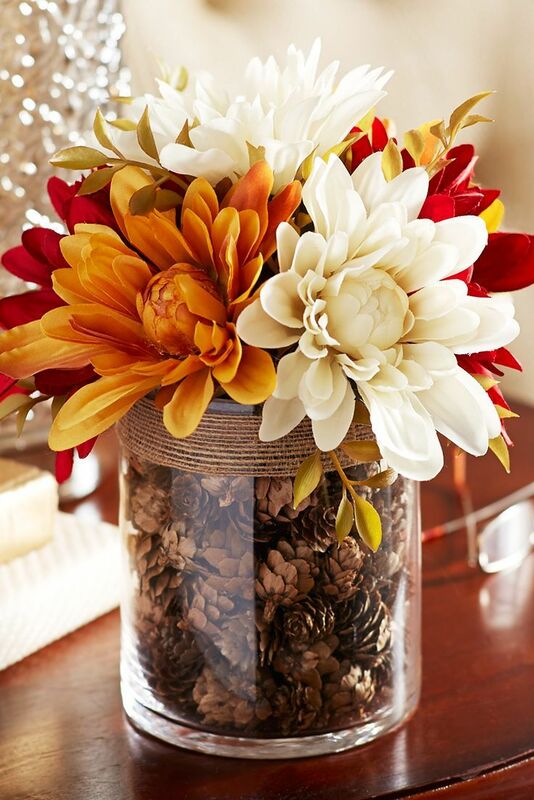 Simplicity and natural beauty mark this display of fall flowers. Large dahlia blossoms, in various shades of autumn, rest comfortably together at the top of this display. Below, a large cylindrical vase holds a multitude of pine cones where the blossom stems rest. Simple raffia twine encircles the collar of the vase for the final touch.